A property or building can be owner-occupied or rented; the latter being an investment property. In the present market (1996) it may of course be vacant, resulting from being surplus to the owner’s requirements or a poor investment! 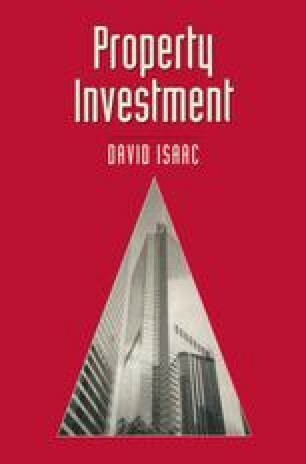 A large proportion of property is owner-occupied but most of the conventional texts and theories in property are applied to the investment market. The investment market for property cannot be seen in isolation from other investment markets. The application of funds to property has to reflect competition from other forms of investment. The decision to invest in a particular area will be a comparison of return and security and thus knowledge of alternative investments and their analysis could be very important. The application of financial techniques to property investment can also be important and this can clearly be seen in the securitisation and unitisation of property which is a key area of development in property investment. Another important point to be made concerns the nature of the lender and the property to which finance is applied. At its simplest, the financial arrangement may deal with an individual purchasing a single property with a single loan, but it is usually more complex. Finance is generally raised by corporate entities, such as property companies, using existing property and other assets as collateral for the purchase of a portfolio of assets which may include property assets but not exclusively. Finally, it is important to realise the significance of property and property investment to the economy. The importance can be shown in three different ways: as a factor of production, as a corporate asset and as an investment medium.